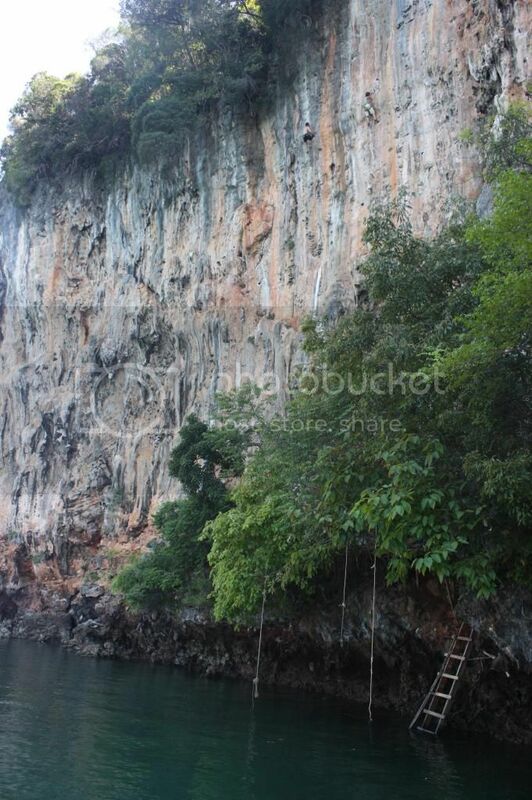 On March 20, 2012, I fell while rock-climbing on an island in Southern Thailand called Koh Yao Noi. 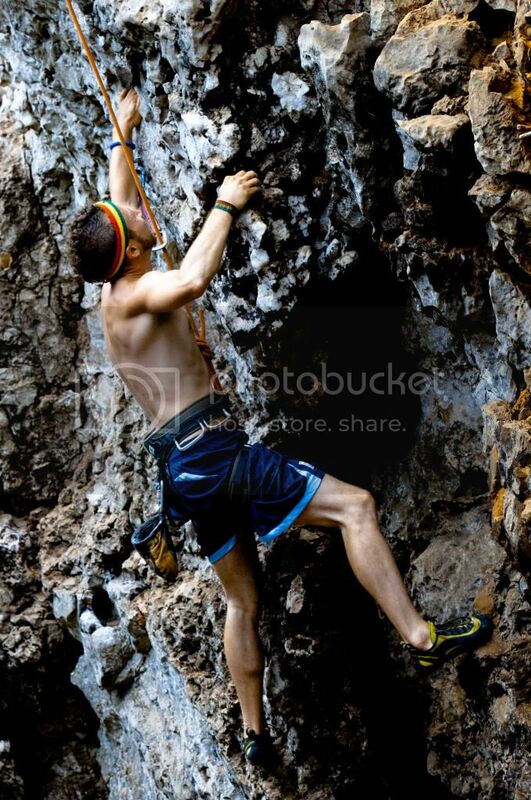 I was sport climbing, and in sport climbing, the lead climber clips into bolts implanted into the rock face, anchors at the top of the route, and descends back down to the ground. Then the second climber top-ropes the route, or removes the equipment as they ascend to the top of the route. When I fell, I was top-roping. The lead climber who preceded me anchored at the top of the route to an insecure bolt, so when I got to the top of the route, I clipped directly into the anchor with a sling, untied the rope, took down the equipment, tied the rope back into the anchor, and began to descend. I made it most of the way down when the rope snapped and I fell approximately ten feet to the ground. When I hit the ground, the wind was knocked out of my diaphragm. I couldn’t breath at all for about a minute. The first thing I managed to say when I finally caught my breath was, “What the F___ just happened?? ?” I was climbing with a group of about six people, one of which was a professional climbing guide named Eva. When I hit the ground, Eva reacted immediately. She had me lay completely still and flat on the ground. She established that I could move my extremities, which I could without issue. Then she had me scan my body to feel where I was in pain. It became immediately apparent that I had injured my ribs. Any movement was extremely painful, especially breathing. I then realized something was wrong with my neck. There was a sharp pain as if I had slept on it wrong but much much worse. I continued to scan my body to see if any other bones were broken or if any other serious injuries had occurred. Nothing else felt terribly wrong, so we started the process of moving me down onto the boat which took us to the rock face where we were climbing. When I got to my feet (with the help of about four people) I immediately realized something was very wrong with my left ankle. I couldn’t put any weight onto it. Walking was not easy, but I had a small group of people on either side of me helping me. I was climbing at a sheer rock face from a small platform built out from the rock. A ladder extended down to the ocean from the platform where a boat was waiting. Getting down to the boat was not going to be easy. I was still wearing my climbing harness, so they tied a rope into my harness before I started to climb down the ladder. With a rain jacket tied around my neck, I slowly made my way down to the boat. Once I made it down, I laid down on the floor of the boat and we took off for the dock where an ambulance was waiting for us. During the boat ride, the gravity of the situation began to set in. It became clear to me all of the sudden exactly what just happened and how easily my life could have just ended. Two or three women with whom I was climbing that day were all looking down at me in an effort to comfort me, and it was then that the emotions started to pour out of me. Tears started rolling down my face as I began to think about my mother and how I was going to break the news to her. I still didn’t know exactly what had happened to me in regards to how severe my injuries were, so I didn’t know exactly how my travel plans would be affected. All kinds of things ran through my head. We pulled into the dock where an ambulance was waiting. All of the Thai people who worked at the dock were standing around watching, wondering what had happened. They brought a stabilizer board onto the boat and strapped me to it. Then they carried me to the ambulance on the board. It would be the first ambulance ride of my life. I was transported to what we called the “mission hospital” (a small building with basic capabilities) on Koh Yao Noi where x-rays were taken to assess the severity of my injuries. Depending on how severe my injuries were, they were going to have to transport me to a major hospital on Phuket, a nearby, much larger, island. X-rays were taken on my neck and ankle. The x-rays on my ankle came back negative, but it was revealed that I had fractured some vertebrae in my neck. I needed to go to a major hospital in Phuket. When I found out I had broken my neck, I started to cry again. This was serious. This wasn’t some minor injury I could simply remedy by resting up for a couple weeks laying low and getting back to normal soon. This meant I was looking at a lengthy period of time in a neck brace at the very least, and my life might be forever changed. A friend had met me at the hospital with my passport, wallet and cell phone. I would need them to be admitted to the hospital in Phuket. My friend and I got back into the ambulance and rode to the dock where a speed boat was waiting for me. 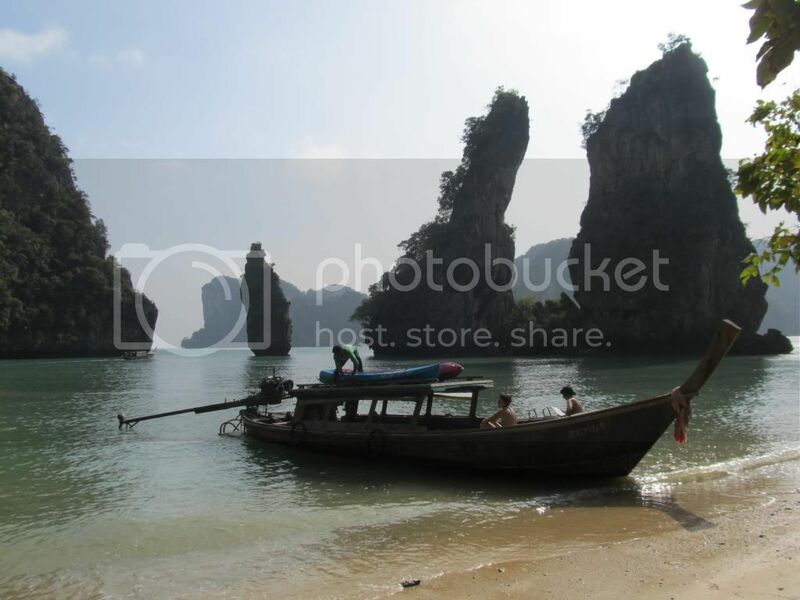 It’s about a 35 minute boat ride to Phuket. I had made that boat trip many times before but never strapped to a stabilizer board in the dark. Another ambulance was waiting for me in Phuket to take me to Bangkok-Phuket International Hospital. I arrived at the hospital and was taken into the emergency room reception area. I was taken into a room where x-rays were taken on my ribs, ankle and neck. An orthopedic surgeon came to consult with me about my injuries and course of treatment. He told me I had fractured two vertebrae in my neck, broken one of my ribs, and sprained my left ankle. He fit me for a Philadelphia collar neck brace and admitted me to a private room in the hospital. By the time I got to the hospital room, it was around 10:30pm. I had fallen around 4pm. I was exhausted. I had to call my mom. I had to process everything that was happening to me. I had to come to grips with the new reality that was crashing down onto my mind, but first I needed to rest. I woke up the next morning to a nurse coming into my room to take my blood pressure and ask me what bodily fluids I had released throughout the night. Luckily the nurses all spoke enough English to communicate pretty effectively. It’s a strange feeling waking up somewhere not immediately knowing where you are and how you got there. After the few seconds it took to gain my bearings passed, I realized I still hadn’t called my parents. Just as that thought popped into my head, my cell phone rang. It was a friend of mine who had left Thailand two weeks prior and was back in the United States. I broke the news to her and asked her to call my parents for me. She told them the news and let them know I was available via skype. A few minutes later I skyped with my parents. Needless to say, it wasn’t easy. I just kept saying I was sorry. For months after the accident, whenever anyone would see me in my neck brace or hear about what happened, almost everyone’s initial reaction was, “Oh my god, your poor mother!” My mom’s response would always be that because she could see me on her computer screen, she could hear my voice, and she could see that I was OK, she didn’t freak out too much. While that made me feel a tiny bit less guilty, I honestly think the worst part of this entire experience was putting my mom through all the pain and difficulty that my accident caused her. There’s noone in the world I love more than her and to think that I caused her hardship on this level is really difficult for me to accept. My mom and my uncle arrived at the hospital in Thailand about 7 days after the accident. They checked me out of the hospital and into a hotel in Kamala beach in Phuket. At that point, we didn’t know exactly what I was capable of in terms of traveling. A friend of my family is an orthopedic surgeon specializing in spinal injuries, so we were consulting with him in regards to my course of action. His recommendation was to come back to the US as soon as possible so that he could operate on the fracture and stabilize it. The doctor in Thailand had told me that surgery was not going to be necessary. His recommendation was to have me wear a neck brace for a matter of 4-5 months and let the bones heal on their own in that time. Either way, I wasn’t ready to fly home that day. I needed to regain some strength, let my ribs heal, and collect my things to take back home with me. We spent a week at a resort in Kamala beach, about a 20-minute ride from the hospital. It was not at all how I wanted to spend my last week in Thailand. Koh Yao Noi is a very quiet, peaceful island devoid of big ritzy resorts full of overweight European tourists parading around in speedos. Now I was smack in the middle of touristy Thailand world right up to the Thai Elvis impersonator singing in the hotel bar. My uncle had been to Thailand about 20 years prior, but this was my mom’s first trip to Asia. I was pretty disappointed that this was going to be her first exposure to Thai culture. It was also the first time I had seen my mom in about 5 months, the longest we had ever been apart. That week was a good time for us to reconnect and for me to share the experiences of my travels with her. One week after I checked out of the hospital, I flew home. My brother bought me a first-class ticket from Phuket to New York so that I could sit in a chair that could recline. It was my first time flying first-class. The flight wasn’t easy or comfortable by any means, but having flight attendants pay extra special attention to me definitely helped things go more smoothly. After spending two days in New York, I flew back home to Buffalo. When I got home to my parents’ house, I had come full-circle. In moving to Thailand, I had gotten as far away (geographically) as possible from the protective nest my family and hometown represented. Now I was back in the heart of it and 100% dependent on the people around me. I remember feeling so embarrassed and defeated. Growing up in Buffalo, NY, a lot of people leave. I grew up hearing about people who went out and did different things. There was always a divide in perception between the people who accomplished things outside of Buffalo and those who stayed. I made a grand exit out of Buffalo, and now I was back, hobbled and broken. Those feelings of embarrassment and shame quickly subsided, however, when the outpouring of support and love came flooding my way as soon as I got back into town. Two days after getting home, I went in for a consultation with an orthopedic surgeon. He told me the fracture had destabilized, was moving closer to my spinal column, and he wanted to operate as soon as possible. This was not the news I was expecting, or looking to hear. The surgery he recommended is called a cervical fusion meaning he would fasten metal rods onto either side of my spine spanning above and below the fracture. The range of motion in my neck would be permanently reduced, I would have metal implants in my neck, I would have a pretty sizable scar on the back of my neck, and it would take about 4-6 months to fully recover from the surgery. We set the surgery for the next Monday, about four days away. All kinds of things were swirling through my head in the four days leading up to the surgery. Going under general anesthesia for the first time scared the hell out of me. Having someone operate on my spine completely freaked me out as well. A lot of my friends and family reached out to comfort me during that time which made an enormous difference. I tried to embrace the reality I was facing in order to deal with it the best I could, not run from it out of fear. That mentality ultimately helped me step up to the fear, look it down, and deal with what was in front of me. I went in for surgery the following Monday and everything went 100% successfully. The week after surgery was pretty rough, recovering from the anesthesia, dealing with the extreme soreness all over my neck and upper back. The pain medication helped a lot, but it came with its own side effects like nausea and other extremely unpleasant feelings. On Sunday morning I was discharged from the hospital. Over the next three months I wasn’t able to physically do much of anything besides devote as much energy as possible to healing. I did my best to make productive use of my time, meditating, reading, writing. I started physical therapy in August. Eventually I was able to start practicing yoga, dancing, and performing other physical tasks that I had lost the ability to perform. Whenever I did something for the “first” time, I was always filled with an extreme sense of gratitude. Every waking second, every breath I breathe is all a gift at this point. I never realized how much I took for granted until it was all taken away from me. I’m so incredibly fortunate to have made a full recovery. I feel as though the rest of my life is dedicated to returning the favor the universe did me by allowing me to live. Life is a gift. It’s up to us to honor that gift and not waste it. That goes for every second of every day we have to be alive. None of us know how much time we have left. If you knew exactly how limited your time on Earth was, how would it change the way you live your life?